Canon Pixma MX475 is all-in-one printer designed for everyday printing tasks at home or in a small office. This budget-friendly inkjet photo printer produces high-quality outputs for all functions including printing, copying, and scanning with its high yield Canon Pixma MX475 ink cartridges. The built-in wireless networking, flexible mobile support and fax capabilities make it a perfect choice for home and office users. This compact all-in-one machine weighs approximately 8.4kg and measures 458 x 385 x 200 mm. It boasts compatibility with various printing app solutions like Google Cloud Print, Apple AirPrint, and PIXMA. It also allows direct printing from various mobile devices. With a 30-sheets ADF, CIS colour scanner, LCD screen, flatbed scanner, super G3 fax mode, this multifunctional device ensures greater productivity to office users as well as to home users. Canon Pixma MX475 is a compact all-in-one printing device designed for home and small office users. This budget-friendly device offers superior productivity with its high-end features like wireless connectivity, flatbed scanner, ADF, fax functions etc. It uses 2 Canon Pixma MX475 ink cartridges to deliver professional quality photo prints. This printer offers good speed while producing black and white documents but slows down substantially when printing colour files. It is capable of producing only 9.7 ppm in monochrome and 5.5 ppm in colour. However, if we overlook the speed the device is still a great choice for home and office users. Q. 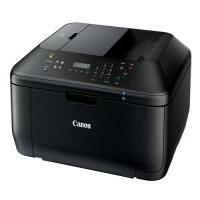 Is Canon Pixma MX475 printer compatible with Apple AirPrint and Cloud print? A. Yes, the printer is compatible with Apple AirPrint, Cloud Print and Pixma. So, one can stay connected from either an iOS or Android device. Q. I’m looking for a budget-friendly device for my small office use. Can you suggest me one? A. You can look forward for Canon Pixma MX475 printer. This budget-friendly printer produces good quality with its high-end features like wireless connectivity, flatbed scanner, automatic document feeder, fax function etc. You can even print from various mobile devices. Also, the printer offers good printing speed for black and white documents and it uses 2 Canon Pixma MX475 ink cartridges for producing professional quality photo prints. Q. While printing, I had a paper jam in my Canon Pixma MX475 printer and I’m unable to remove the jammed paper. What should I do now? Turn off the printer and unplug the power cord from the main power supply. Open the paper output tray and remove the pages on the front tray (if any). Hold the jammed paper properly and pull the paper slowly without tearing it. Make sure that all the jammed paper are removed. Close the paper output cover and then reload the paper. Q. What function can the Canon Pixma MX475 printer perform? A. The printer can produce high-quality outputs for all the functions, including printing, scanning and copying with its two high-yield Canon Pixma MX475 ink cartridges. Q. When is the best time to replace the Canon Pixma MX475 Ink Cartridges? A. You should always keep the cartridges handy and If possible should replace the inkjet cartridges before they run out. This will stop ink from drying in the print head between replacement. Q. Do you provide any certified guarantee for your products? A. Yes, all our products are FSC certified and FSC tested. We guarantee you that all the products are manufactured in order to provide 100% customer satisfaction guarantee. Q. What is the lifespan of the Canon Pixma MX475 Ink Cartridges? A. The lifespan of an ink cartridge depends upon a number of factors. The most important one is whether the cartridge is opened or sealed. Cartridges sealed in the original packaging and stored in a cool, dry place should last for up to maximum months. It is also a good idea to store your Canon Pixma MX475 Ink Cartridges in an upright position as they would be placed in the printer. The lifespan of a cartridge also depends on the kind of wear and tear it gets over the time period it is in use. If you do a lot of colour printing obviously the ink cartridges will get empty much quicker than expected. Q. Do you offer a money-back guarantee for non-faulty items? A. Yes, if you have ordered wrong cartridges for your printer, you can return them back following our return policy. The product should be sold in its original packing in a resalable condition. If the product fulfills all our terms, we will place a refund for an item back into your account. Q. The machine cannot be powered on. What should I do now? Make sure that the power plug is securely plugged into the power cord connector of the machine and then turn it back on. Unplug the machine from the power supply, then plug the machine back in and turn the machine back on after leaving it for at least 3 minutes. If the problem is still not resolved, contact the service center.